Contents: Pizza, casserole?, fruit cup, celery with peanut butter and raisins (aka ants on a log), carrot slices, chocolate milk, ranch dressing, fruit rollup, rice crispy treat and Fritos. Notes: Seems like a lot of food, mostly crap. Honestly, how many calories do we have here? Pizza does look like perhaps it was made on site, instead of shipped in, so that is a plus. I think all that grease would probably make me very sleepy afterwards and not able to concentrate on schoolwork! yeah lot of variety, but mostly junk. Makes me sleepy just looking at it. Yeah, carb and fat overload. OMG - that is disgusting! Grease? All I see is carboydrates! Where is the real food? The pizza is not made on site. The pizza is just reheated there.Honestly, I don't think that the cafeteria actually made any of the food themselves, but just bought pre-made items and reheated them. I would have loved to have the french school lunches versus the slop I had. 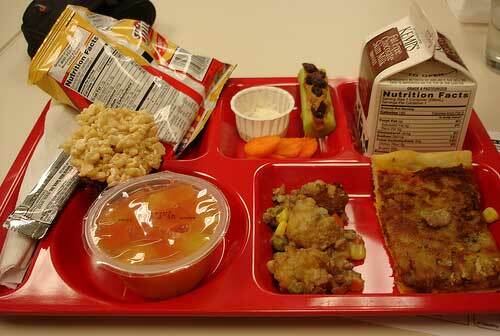 I also wished that US school would use real plates and silver wear instead of stryofoam trays and paper bins that they use now. I usually ate the school lunch available at the cafeteria growing up (I graduated high school in 2009). It is awful and greasy. I don't even think they use real cheese, I think they use the processed cheese stuff.